My dream of becoming a professional musician came true when Ginny Blair asked me to be her studio’s associate piano teacher mid-2016. I began teaching in her studio addition in the beginning of 2017 and have since grown my student body consistently. The best part of being in my position is having the opportunity to witness such musicality, devotion, passion and creativity from children of all ages! I have had the pleasure of working with some adult beginners (and adults wanting to get back to the piano) as well. It is difficult to imagine a prouder moment than hearing my student play a flawless and exciting original arrangement of the Simply Music® blues after only about six months of lessons. Besides teaching piano and running my small business within Ginny’s studio, I myself am a student of music. I’m currently working towards my BA in Music at the University of California, Berkeley. I am thrilled to be putting my full attention on learning, playing and teaching music. I teach all my piano students using the Play-a-Story and Simply Music® piano programs. 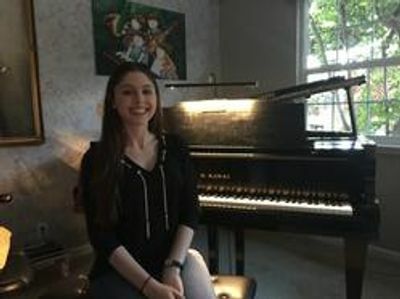 Through these methods, students are able to get right on the piano, learning how to navigate the keys and create a variety of styles of music (blues, ballads, accompaniments and classics) before being introduced to the world of reading. I believe in the importance of building a committed relationship with a musical instrument. My goal is to create a safe, supportive and fun space for students to experience their musical highs and lows, and for all students to develop a lifelong love of music and learning. Copyright © 2018 Music with Ginny | All Rights Reserved.